Why is English Pronunciation Important? Good English pronunciation is an essential part of good communication. If you don’t have clear English pronunciation, other people may not understand what you’re saying. Mistakes in pronunciation can cause major misunderstandings. Imagine if you ask someone for a pen to write with, but you pronounce pen as “pan.” The other person may try to give you a frying pan! Your English pronunciation is the first impression other people get when you speak. 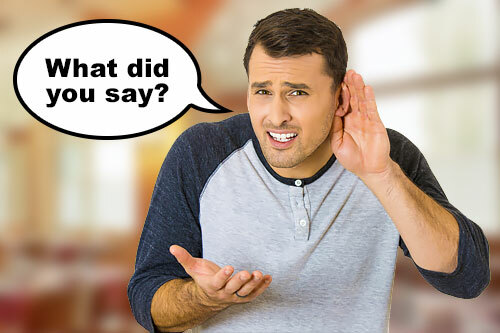 You may have excellent reading and writing skills and know all the grammar rules, but other people will judge your English by what they hear – your English pronunciation. If people have a hard time understanding you, they will think your English is not good. With good English pronunciation, you will impress other people with your language skills. You will also have more self-confidence when you speak, knowing that others can understand your English. To improve your English pronunciation, follow the tips and do the many educational activities in USA Learns described below. Listen and pay attention. Listen to spoken English and pay attention to how the words are pronounced. Listen again if you can rewind. Let the sounds of the words fill your ears. There are many different things you can listen to: videos, podcasts, newscasts, TV shows, and radio. Listen and repeat. Listen again and repeat the words and sentences to yourself. Try to copy the English pronunciation of each word. Practice. This means speaking the words and sentences out loud. Quietly reading or just saying word in your head is not enough. You need to move your tongue and mouth, forming the sounds properly, to really practice your English pronunciation. Don’t guess at the pronunciation of words. This is how you develop bad habits. You say a word incorrectly so often that your brain thinks it’s correct. Listen to native speakers and try to imitate their pronunciation of the word. Check the pronunciation of English words in a dictionary. 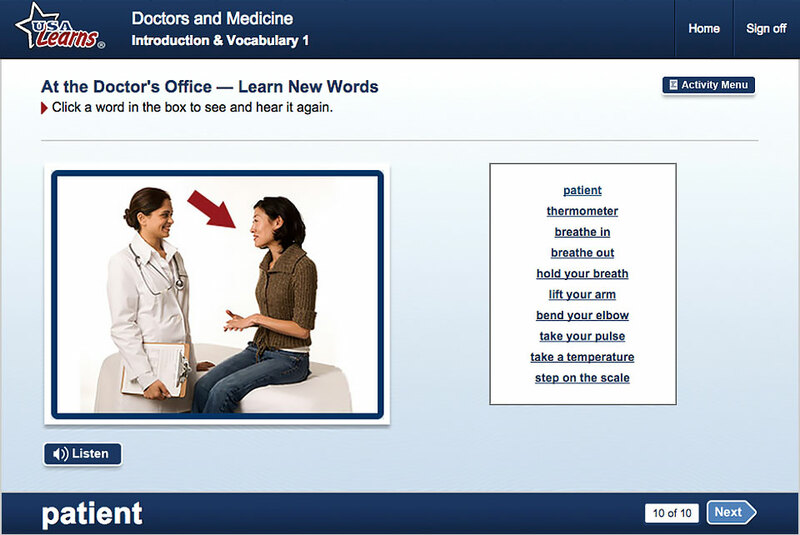 Most online dictionaries offer the audio pronunciation of the word. In the educational activities of USA Learns, there are many videos and audio readings that will help you improve your English pronunciation. Almost every page of USA Learns has a Listen button so you can listen to the speakers many times to give your ears listening practice. Remember, pay attention to pronunciation and try to imitate it. 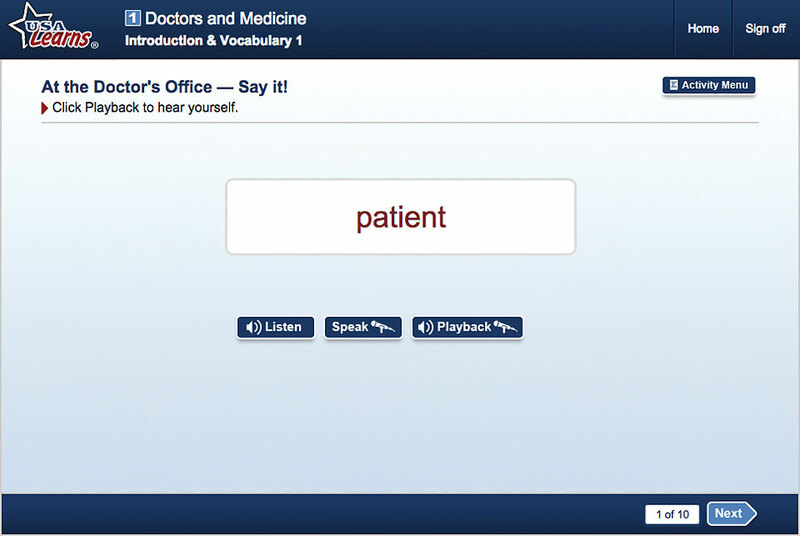 In the Learn New Words activity, you hear the pronunciation of each word. Click Listen and say the word to yourself. Try to copy what you hear. Here at USA Learns, there are many videos that offer lots of listening opportunities to help you improve your pronunciation. You can choose to see the transcript of the video. After watching and listening, it’s a good idea to read the sentences out loud to practice your pronunciation. 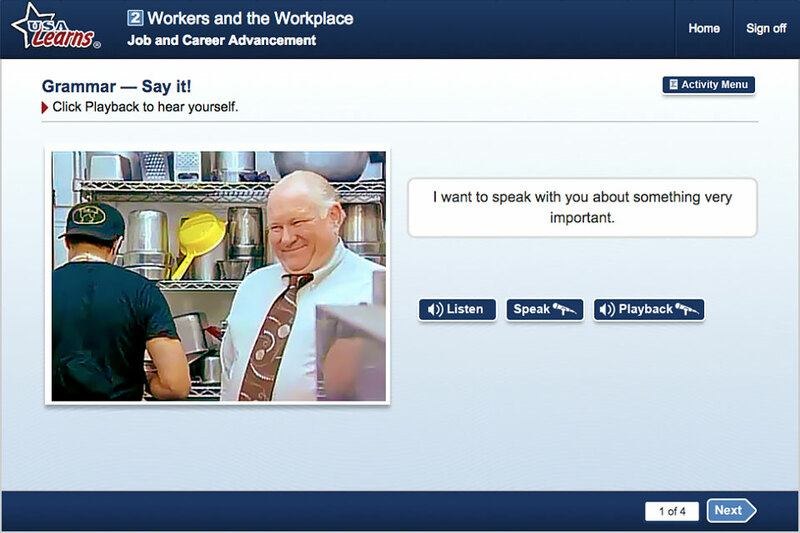 You will practice listening very carefully to English pronunciation in the Listening Match activities. You hear a word or a complete sentence and you must select the word you heard. This forces your ears to listen very closely. You ears have to distinguish sounds that are similar. If you can hear different sounds, you can pronounce them. It’s time to practice your own English pronunciation! You can practice the pronunciation of all the key vocabulary words from every unit in the Say It activities. Listen to the word as many times as you like. Click Speak and say the word into the microphone. Click Playback to compare your English pronunciation to a native speaker. Listen carefully to the native speaker and also your voice on the recording. Still not good? Repeat. Do it again until you are happy with what your English pronunciation sounds like. Just practicing single words is not enough. You also need to practice your English pronunciation saying complete sentences. In sentences you have to be able to say many words all together with the correct rhythm. Your voice must go up and down in the right places. It just takes practice. 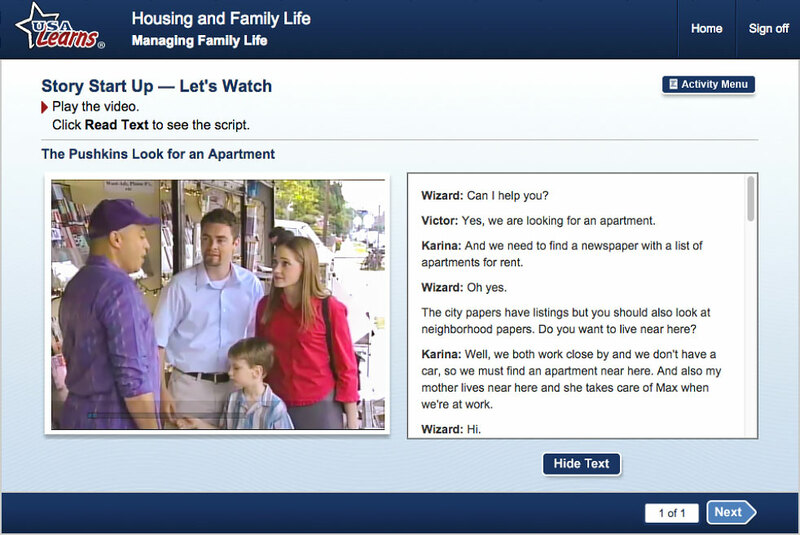 USA Learns offers activities for you to practice pronunciation of whole sentences. 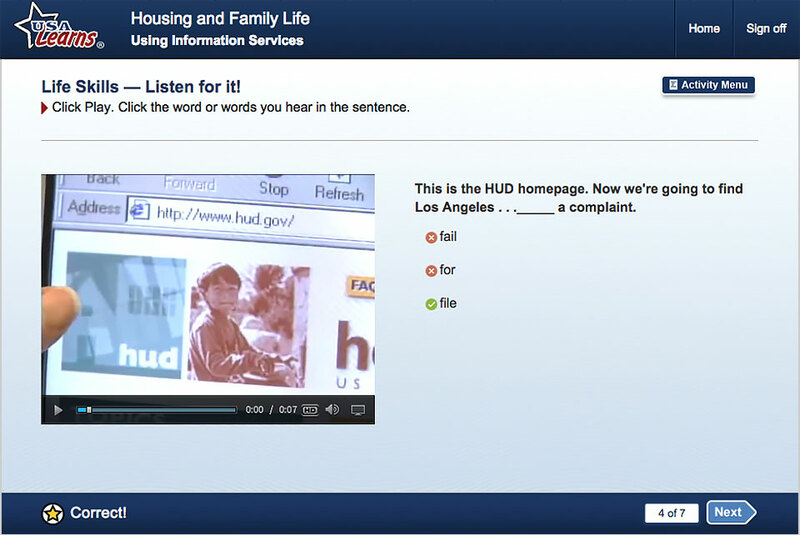 Here is an example of a Say It grammar activity. Even when you are practicing verb forms, we believe it’s always important to practice your English pronunciation and speaking skills. 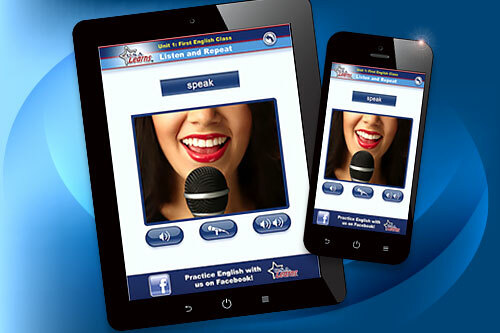 Have you tried the USA Learns English 1 (2, 3 and 4) apps? These iOS and Android applications offer an excellent opportunity to practice your English pronunciation when you are not at your computer. There is a pronunciation activity similar to what is on the USA Learns website, except you can do it on your cell phone or tablet. How convenient! In this activity, you can record your voice and compare your English pronunciation with a native speaker of English. Your goal as a language learner is to make your communication in English as clear and perfect as possible. In English, we say 'Practice makes perfect.' No one’s pronunciation is perfect, but with pronunciation practice you can move closer to clear and perfect communication. English pronunciation is one important part of your language skills you can improve with practice at USA Learns! REGISTER NOW to improve your English pronunciation with USA Learns!